So you’re ready to buy some land to put your tiny house on! What are some financial and legal factors to consider when searching for tiny house property? 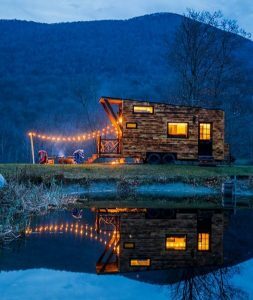 You’ve found beautiful land, but can you put a tiny house on it? 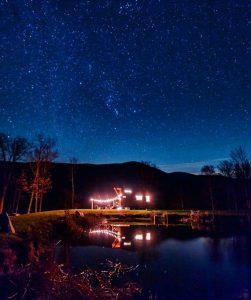 Although many people dream of a completely off-grid tiny house in the middle of nowhere, you’ll still need to find a way to get water and power to your house. The less distance from the road, the less expensive it’ll be to have power and water lines installed. For electricity, the cheapest and easiest option is to plug into an existing power source. Others choose to power their homes with solar power. Click here to learn more about solar power for tiny houses. For fresh water and waste water, city water and sewer are one option; pieces of property in less dense locations that don’t have city water and sewer will need to use a well and septic systems. If the land already has electricity and water hookups, you won’t need to worry about having those put in. Generally, although not always, it’s less expensive in the end to buy land that already has utilities than buying land without and then paying to have them installed. Be sure to factor in these costs when looking for land. Become familiar with the town’s laws for the type of tiny house you want. Every zone of every town has different laws regarding where you can put different types of tiny houses, so unfortunately there aren’t any exhaustive lists of “where to legally put a tiny house”. The first place you should look for answers is in the town’s zoning bylaws and building codes. If the town’s website doesn’t have them, you may have some luck with searching for your town on ecode360.com. Otherwise, call your town hall to ask about your tiny house project. Note that there may be different rules in different zones of each town, so find out what zone your property is in (there will often be a zoning map alongside the zoning code on your town’s website) before moving forward. For permanently-affixed houses, meaning houses on foundations, find out if there is a minimum square footage for residences. Even if there’s not a minimum square footage, other factors may affect the size of your house, like the road frontage on the property. In the zoning and building codes, use the search terms “minimum”, “frontage”, and “square feet” or “sq ft”. Water and electricity would be connected permanently to a tiny house on a foundation, just like a regular-sized house. Interested in a tiny house on wheels? Not all tiny houses are certified, but the turnkey tiny houses on wheels B&B builds are certified by the Recreation Vehicle Industry Association, or the RVIA, meaning they are built to high safety standards that the government can understand, they can be financed as RVs, and they can be parked anywhere RVs can go, using RV hookups to get water and electricity to the house and wastewater from the house (Click here to read more about RV hookups on tiny houses). Use the search terms “RV”, “Recreation Vehicle”, “Recreational Vehicle” in your town’s zoning code to see if RVs are allowed in your property’s zone. Building codes won’t apply to RVs since they are legally considered vehicles rather than buildings. After you’ve looked over the zoning and, if applicable, building codes for your specific zone of your town, you may need to ask the town permission to have a tiny house on your property. Although people have been traditionally living in very small living spaces since the beginning of humanity, in more recent history, tiny houses are a relatively new phenomenon in our modern western world. Therefore, most towns don’t already have tiny houses written into their zoning or building codes. If this is the case, don’t be discouraged: it doesn’t mean you can’t do it, it just means you’ll have to introduce the concept to the zoning board. In this blogger’s experience, zoning boards are made up of passionate people who want to find housing solutions for their towns. With tiny house TV shows and news stories all but taking over television networks, no doubt at least a couple of the folks on your town’s zoning board will already have an idea of what tiny houses are. They’ll let you know whether you need a special permit to have a tiny house on your property, and if so, guide you through the process.